TPV Technology, the company that produces monitors under Philips brand, has started to sell displays with QD Vision’s Color IQ quantum dot technology. What makes this notable is that QD Vision's technology is one such method being developed to significantly and inexpensively increase color gamut that displays can produce. The new 27” monitor can cover 99% of Adobe RGB color space, and is launcing at just $299. The quality of LCD monitors as well as their ability to accurately display colors depends on multiple factors, including the quality of their panels as well as backlighting. While there are panels which can cover very wide color gamuts, since typical LED backlights usually do not produce whites with a broad underlying color spectrum, color accuracy of actual mainstream monitors gets limited. Several companies, including 3M and QD Vision, propose to apply special quantum dot filters on the backlights to make them as “white” (and therefore as broad) as possible. QD Vision’s Color IQ quantum dot technology is based on cadmium selenide semiconductor nanocrystals, which can very precisely control spectral output of LED backlighting, essentially allowing light to be shifted to other wavelengths in a controlled manner. The quantum dots can be made to emit at any wavelength beyond the source wavelength with very high efficiency and narrow spectral distribution, which helps to make backlighting cleaner and thus enhance color gamut of displays. Applying quantum dot filters in any form is a relatively cost efficient task because it is basically a process step in assembly of an LCD module. However, those filters have to survive temperatures produced by LEDs, which is why they are not applied everywhere. 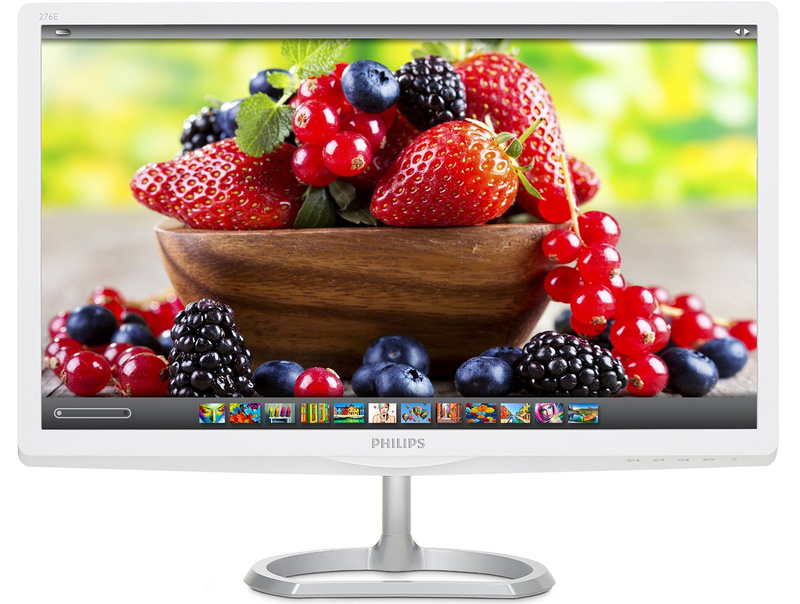 The Philips 276E6ADSS monitor is based on a 27" IPS-ADS panel with 1920×1080 resolution, 178°/178° horizontal/vertical viewing angles, 1000:1 contrast ratio (20M:1 dynamic contrast ratio), 300 cd/m2 brightness, 5 ms gray-to-gray response time and 60 Hz refresh rate. 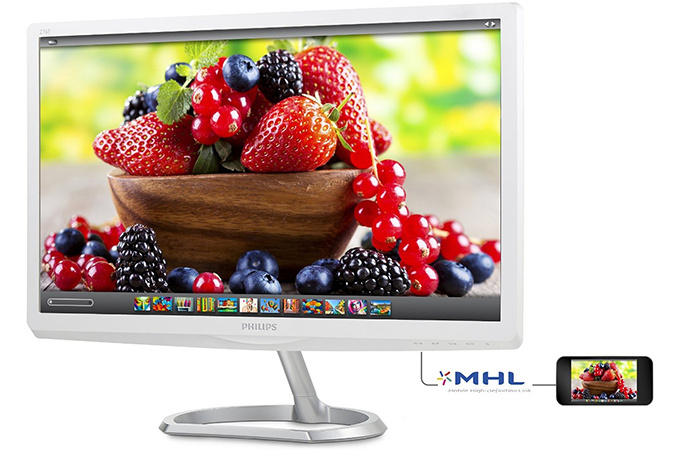 The display features a D-Sub, a DVI and an HDMI with MHL connectors along with audio in and out. Thanks to quantum dot film on the backlight of the monitor, the 276E can cover 99% of Adobe RGB color space, whereas typically inexpensive displays only show around 70% of the Adobe spectrum. The new Philips 276E monitor is made of plastic and uses a rather calm white/silver color scheme. While the Philips 276E display is a product with a rather unique combination of low price and wide color gamut, for TPV Technology it is also a test vehicle for quantum dot technology from QD Vision. Since this is the first ever display with QD Vision’s Color IQ tech, some of its early samples had teething problems. The review unit received by AnandTech did not support constraining to the sRGB color gamut. As soon as we mentioned this fact to the manufacturer we were told that later versions should have a proper sRGB operating mode. The new monitor is already available at Amazon, B&H and some other retailers for $299. Still it's great for doing color correction, and at that price, you could afford a 2nd one. I'm hoping Quantum Dot filters down into the 34" Curved IPS monitors with Gsync/Freesync. Quite happy with my Philips 32 inch FTV 32PFL5605H @1920X1080.